A large percentage of youth involved in the juvenile justice system experience mental health problems, yet many do not receive mental health care. In this study, we used a process-focused framework of mental health decision making to gain insight into the use of mental health services among these youth. In-depth interviews were conducted with nine youth and nine parents participating in a program servicing youth with mental health problems who have been in detention. 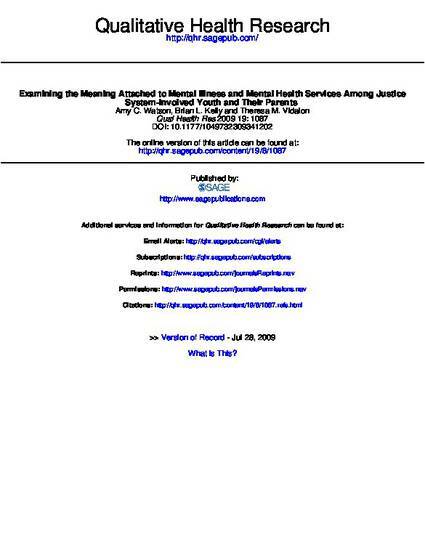 Themes related to problem recognition, the decision to seek and participate in services, subjective norms, and juvenile justice system involvement emerged. Most families acknowledged their youth was having problems, but few defined those problems in mental health terms. This did not prevent them from seeking services, although some were not able to access adequate services until the justice system became involved. Participants were aware of negative attitudes about mental illness, and might have limited their social networks to shield themselves.